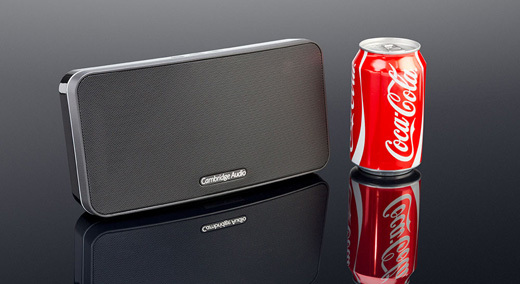 THE LATEST PRODUCT in Cambridge Audio’s Minx wireless music system range is the Minx Go. Unlike the Minx Air 100 (reviewed here) and 200 (reviewed here), the Minx Go is a portable unit. It’s designed to pair with smartphones, tablets or computers and is powered by the latest intelligent lithium-ion rechargeable battery technology, which is said to keep it up and running for almost twice as long as typical competitor products (up to 18 hours is claimed). The new battery technology also allows for fast recharging, with only two hours needed to reach a fully charged state. For added flexibility, when connected to the mains, the Minx Go can also be used to charge tablets or phones thanks to its inbuilt USB power socket. Minx Go supports Bluetooth and it stores up to eight paired phones, tablets and computers. Despite its portability, Minx Go features five drivers, a digital amplifier and Digital Signal Processing (DSP) technology, along with a Bass Radiator integrated into the rear panel. The drivers include two Titanium tweeters and twin 2-inch woofers housed in an acoustically damped body. Minx Go is available now in high gloss black or white at $299. What a drag they had to use a can of poison to show its relative size. Couldn’t they have used kombucha or coconut water?